Military ethicists concede that drones can turn war into a video game, inflict civilian casualties and, with no Americans directly at risk, more easily draw the United States into conflicts. But within the military, no one disputes that drones save American lives. Many see them as advanced versions of ‘stand-off weapons systems,’ like tanks or bombs dropped from aircraft. Inside the Air Force headquarters at Joint Base Langley-Eustis, Virginia, hundreds of flat screen TVs hang from industrial metal skeletons in a cavernous room. This is one of the most sensitive installations for processing, exploiting and disseminating a tsunami of information from a global network of flying sensors. In February, researchers unveiled a hummingbird drone, built for the secretive Defense Advanced Research Projects Agency, which can fly at 17 kilometers per hour and perch on a windowsill but it is still a prototype. The push in drone technology right now is to develop ‘flapping wing’ technology, or recreate the physics of natural flight, but with a focus on insects rather on birds. Birds have complex muscles that move their wings, making it difficult to copy their aerodynamics. Designing insect is hard, too, but their wing motions are simpler, according to Greg Parker, an aerospace engineer. Aerial drones are transforming the way America Fights its wars. The Pentagon has some 7,000 such devices, compared with fewer than 50 a decade ago. Within the next decade the United States Air Force anticipates a decrease in manned aircraft but expects its number of ‘multirole’ aerial drones like the Reaper, the ones that spy and also strike, to nearly quadruple, to 536. Already the Air Force is training more remote pilots, 350 this year alone, than fighter and bomber pilots combined. 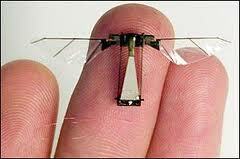 By 2030, the Pentagon envisions, it will be deploying ‘spy flies’ equipped with sensors and micro-cameras. The drone is playing a central role. The Central Intelligence Agency (CIA) spied on Osama bin Laden’s compound in Pakistan by video transmitted from a new bat winged stealth drone, the RQ-170 Sentinel. Three kilometers from where the Wright brothers learned to fly the first airplane, military researchers are at work on another revolution in the air, unmanned drones to the size of insects and birds. The base’s indoor flight lab is called the ‘micro-aviary.’ The drones in development here are designed to replicate the flight mechanics of moths, hawks and other inhabitants of the natural world. “We’re looking at how you hide in plain sight,” said Parker.